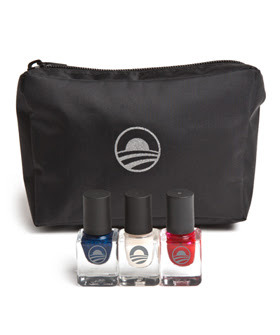 Lush Fab Glam Inspired Lifestyle For The Modern Woman: Politics Meets Nail Art: President Obama's Campaign Releases Nail Polish Collection! 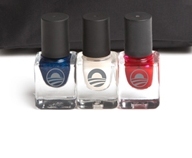 Politics Meets Nail Art: President Obama's Campaign Releases Nail Polish Collection! The Obama Campaign is leaving no stone un-turned in their bid for re-election and they have set their eyes on all the beauty and nail art loving women as they released their patriotic red, white and blue Nail Polish Collection. The campaign collaborated with cosmetics company Le Metier De Beaute to create the mini nail polish collection which can be purchased at Obama's online store for $40 with all sales going toward funding his 2012 re-election campaign. What do you think of the Obama Nail Polish Collection and is the foray of politics into the beauty world creative or over the top? Leave a comment below. SMH I don't even know what to say about this LOL. Definitely creative but $40 is ridiculous.